Since the introduction of the da Vinci ™ surgical system (Intuitive Surgical Inc., Mountain View, CA, USA), more sophisticated surgery has been achieved with improved three-dimensional (3D) visual acuity, 7 degrees of freedom, breakthrough accuracy, and accessibility to surgery. Robot-assisted laparoscopic radical prostatectomy was pioneered in 2001. After the approval of the US Food and Drug Administration (FDA), four generations of the da Vinci system have been introduced over the past 17 years.,,, In 2016, da Vinci installations increased by more than 25%, mainly in urology and gynecology. Several manufacturers are developing alternate robotic systems [Figure 1]. However, due to issues related to patents, clinical deployments are limited ,, Nevertheless, the era of robotic surgery is expected to rapidly evolve as new technologies become available soon. The aim of the present study is to provide a comprehensive overview of the current state of robotic surgery and to predict the future of the surgical robot system based on the current status. A comprehensive literature review was performed using the PubMed electronic search engine. The following search terms were used: “da Vinci” (n = 4308), “robotic surgical system” (n = 2051), and “new robotic surgical device” (n = 760). The references of related papers were used, and the articles and information were searched by Google search engine (www.google.com). According to ISRG's stock report, Intuitive Surgical has maintained its market leader position for over 17 years. Historically, an updated model is launched approximately every 6 years [Figure 2]. 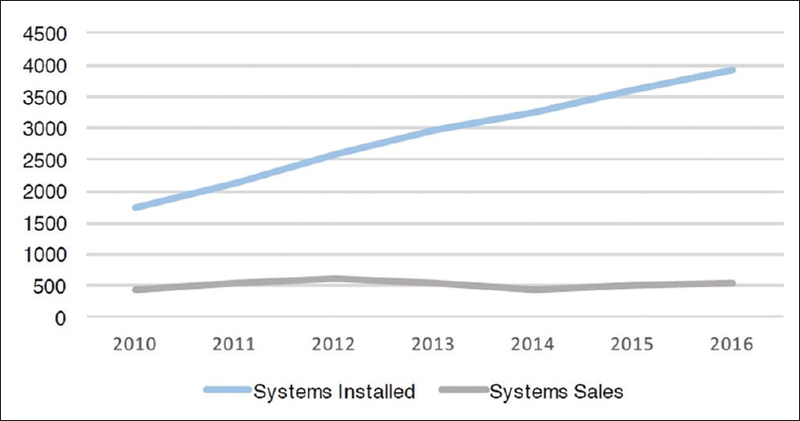 Of the 3919 da Vinci systems installed worldwide at the end of 2016, 63% were in the US, 15% in Europe, 18% were in Asia, and 4% were in the rest of the world [Figure 3]. According to the Intuitive Surgical Investor Presentation in 2017, they have focused on three aims for technical advances; first, “enhanced imaging” which can help surgeons and staff overcome the limitations of the human eye [Figure 4]a; second, “intelligent systems” which can provide to surgeons a real-time feedback [Figure 4]b; and third, “less invasive approaches to the body” [Figure 4]c and [Figure 4]d. They are expected to launch da Vinci X surgical system which is optimized for focused-quadrant surgery for procedures and can incorporate da Vinci Xi endoscope technology, instruments, and accessories in 2017 [Figure 5]. The expected launch of the da Vinci SP will also ignite a new product update cycle [Figure 4]d.
The Revo-i (Meere Company Inc., Yongin, Republic of Korea) consists of a surgeon control console, a four-arm robotic operation cart, a high-definition vision cart, and reusable endoscopic instruments [Figure 1]. The basic configuration and development of this model is designed to be similar to da Vinci systems. A preclinical study with porcine model was completed in 2016. Moreover, the clinical trial in treating patients with radical cholecystectomy or prostatectomy was performed using this surgical system in 2017. The manufacturers obtained a commercialized approval of Korean FDA in August 2017 and new model of Revo-i ® surgical system is expected to be launched. The multiport surgical robotic ALF-X system (SORAR SpA, Milan, Italy) was initially introduced for gynecological surgery and was recently assessed in a preclinical animal study of robot-assisted partial nephrectomy , Fanfani et al. reported that they performed 80 cases of hysterectomy with ALF-X system for benign and malignant disease, from October 2013 to May 2014. They also reported that they performed partial nephrectomy with ALF-X system on pig models. Unlike the da Vinci system, each arm of this device can be positioned independently from the others on the surgical field. The system's unique features also include haptic feedback and an eye-tracking system. Haptic feedback is achieved by counter movements of the laparoscopic handle at the console according to force and direction applied at the tip of the instrument. The eye-tracking system controls camera movements; for example, the image is zoomed in when the surgeon's head approaches the screen. This device consists of a surgeon console and a slave cart which is similar to the da Vinci surgical robot. The first clinical trials were reported in 2014 including one patient with gastric perforation and two patients with acute appendicitis. 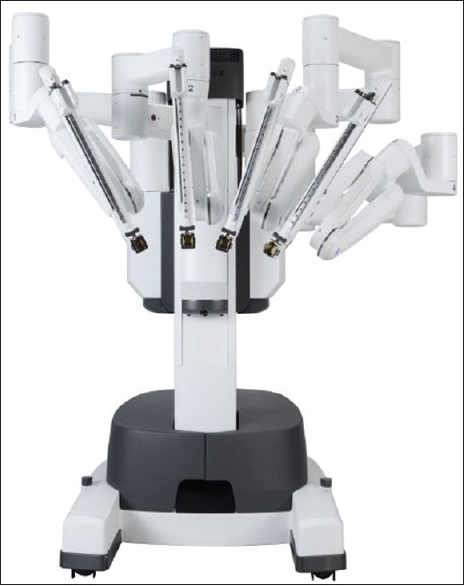 The Medrobotics ® (Raynham, MA, USA) received the US FDA clearance for the Flex robotic system in July 2015. The Flex robotic system provides surgeons with single-site access visualization of hard-to-reach anatomical locations. Remacle et al. reported the first surgical application of the Medrobotics Flex system on humans, by performing three procedures of transoral robotic surgery. Titan Medical (Toronto, ON, Canada), a public company, has developed the Single Port Orifice Robotic Technology (SPORT ™ Surgical system). The system utilizes a 25 mm single-access port that contains two articulating instruments and a 3D high-definition camera. The Versius system (Cambridge Medical Robotics) has arms that are small and light enough to be moved around an operating table as a surgeon pleases. The arm, built like a human arm, has three joints, corresponding to the shoulder, the elbow and the wrist. The da Vinci robotic surgical system developed by Intuitive Surgery for the past 17 years has dominated the robotic surgery market. The surgeons saw the image through the lens of the camera, and the operation was carried out according to the control performed at the console. The competing robot that has been developed does not seem to deviate much from the concept of the basic da Vinci robotic surgical system. However, they are continuing their efforts to evolve into a better surgical robot system than existing ones. For example, the da Vinci system provides excellent 3D visualization of the surgical site and improved dexterity, but it lacks haptic force feedback and subsurface tissue visualization. Laparoscopic or robotic surgery has the disadvantage of not having haptic sense, but this is overcome by the surgeon's experience, by looking at the tissue, whether it is hard or soft. Engineers are trying to introduce haptic technology into robot systems, but the technology is limited at this time. These limitations make the introduction more difficult., There are also many reports of image guidance using navigation technologies and applying to neurosurgery or spinal surgery., However, it is not yet applied to clinical urologic robot surgery. In the closed console of da Vinci system, surgeon's situational awareness can be compromised. To overcome this disadvantage, there are some trials for using 3D glasses or 3D high-definition monitor ,, Rassweiler etal. 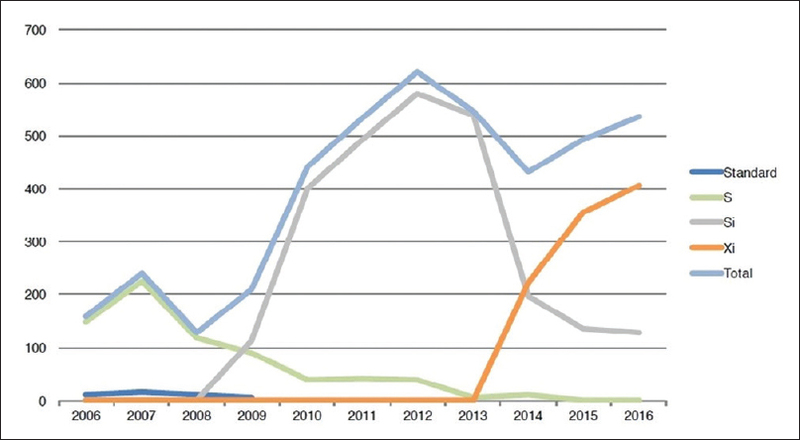 in the “Future of robotic surgery in urology” presented their prediction of the specific development and evolution of technology based on the current technology advances and patent status. For example, the first automobile has vastly evolved to the high tech ones we drive now a day. Furthermore, autonomous cars have recently been advertised and there is promise of an intelligent automobile that drives itself. As such, the robotic surgery system is expected to ultimately follow the automobile model and will evolve onto the automated surgery system. Technically speaking, automated surgery is no more difficult than automatic driving. Because there are no sudden emergency situations such as protruding vehicle or person during driving, once artificial intelligence (AI) acquires the anatomical understanding and the surgical technique, technically automated surgery can be performed. In addition, in more recent years, attempts to learn internal organs through deep learning have been published in various studies, and there are reports that it is possible to learn in the initial stage. Furthermore, if videos of surgical procedures are taught, surgical techniques can be taught to AI, and related studies are underway. An automated surgical robot known as the Smart Tissue Autonomous Robot has proven to be capable of performing some surgical procedures on pigs, such as sewing tissue., The machine operates on its own but is currently being used under designer's supervision. It is designed to perform work within a predictable range, rather than full-scale operations on its own, and is nearing availability for human testing. This machine showed to cut three pig's tissues (skin, fat, and muscle) which are attached markers along the markers automatically in 2017. They showed accurate resection lenses and could suggest that this could be beneficial in tumor resection. Currently, studies are underway to analyze surgeons' performance using a tool of “dVLogger” and to predict efficiency., Based on this, robots can facilitate the performance of surgeons and potentially result in less inadvertent complications and improved outcomes. In addition, the robots that have learned the videos of surgery performed by expert surgeons can also play a role of navigator. It can be used as a guide to the novice surgeon during surgery. However, not only technical barriers but also other barriers such as ethical dilemmas will become issues. Even if AI is technically feasible for surgery, safety must be ensured should any unexpected or inadvertent problem arise. Since it is not possible to conduct experiments on humans without extra cautionary measures, priority will be given to application to animals. However, the question of whether the patient will accept it is another matter. We are on the verge of preparing a second-generation robotic surgery system. This will be the time when not only technical issues but also social issues need to be coordinated and addressed. Obviously, the robotic surgery system will continue to evolve and the surgeon will have to continue to adapt. In the near future, robots will be developed in a way that the number of incisions is less with high precision. A more efficient system will be introduced with greater applicability with more diverse devices while ensuring patient safety. With the advent of AI between the robotic system and the surgeon, a more efficiently functional form of robotic surgery system could be introduced and ultimately the development type will go to an automated robot surgery system. Abbou CC, Hoznek A, Salomon L, Olsson LE, Lobontiu A, Saint F, et al. Laparoscopic radical prostatectomy with a remote controlled robot. J Urol 2001;165:1964-6. Rao R, Nayyar R, Panda S, Hemal AK. Surgical techniques: Robotic bladder diverticulectomy with the da Vinci-S surgical system. J Robot Surg 2007;1:217-20. Kang SW, Lee SC, Lee SH, Lee KY, Jeong JJ, Lee YS, et al. Robotic thyroid surgery using a gasless, transaxillary approach and the da Vinci S system: The operative outcomes of 338 consecutive patients. Surgery 2009;146:1048-55. Tobis S, Knopf J, Silvers C, Yao J, Rashid H, Wu G, et al. Near infrared fluorescence imaging with robotic assisted laparoscopic partial nephrectomy: Initial clinical experience for renal cortical tumors. J Urol 2011;186:47-52. Kaouk JH, Haber GP, Autorino R, Crouzet S, Ouzzane A, Flamand V, et al. A novel robotic system for single-port urologic surgery:First clinical investigation. Eur Urol 2014;66:1033-43. Leal Ghezzi T, Campos Corleta O. 30 years of robotic surgery. World J Surg 2016;40:2550-7. Falavolti C, Gidaro S, Ruiz E, Altobelli E, Stark M, Ravasio G, et al. Experimental nephrectomies using a novel telesurgical system: (The telelap ALF-X)-A pilot study. Surg Technol Int 2014;25:37-41. Kim DK, Park DW, Rha KH. Robot-assisted partial nephrectomy with the REVO-I robot platform in porcine models. Eur Urol 2016;69:541-2. Abdel Raheem A, Troya IS, Kim DK, Kim SH, Won PD, Joon PS, et al. Robot-assisted fallopian tube transection and anastomosis using the new REVO-I robotic surgical system: Feasibility in a chronic porcine model. BJU Int 2016;118:604-9. Available from: http://www.usf.edu/business/documents/departments/finance/smif/analysis-intuitive-surgical.pdf. [Last accessed on 2018 Mar 12]. Available from: http://phx.corporate-ir.net/phoenix.zhtml?c=122359 &p=irol-irhome. [Last accessed on 2018 Mar 12]. Bozzini G, Gidaro S, Taverna G. Robot-assisted laparoscopic partial nephrectomy with the ALF-X robot on pig models. Eur Urol 2016;69:376-7. Fanfani F, Monterossi G, Fagotti A, Rossitto C, Gueli Alletti S, Costantini B, et al. The new robotic TELELAP ALF-X in gynecological surgery: Single-center experience. Surg Endosc 2016;30:215-21. Fanfani F, Restaino S, Gueli Alletti S, Fagotti A, Monterossi G, Rossitto C, et al. TELELAP ALF-X robotic-assisted laparoscopic hysterectomy: Feasibility and perioperative outcomes. J Minim Invasive Gynecol 2015;22:1011-7. Gidaro S, Buscarini M, Ruiz E, Stark M, Labruzzo A. Telelap alf-X: A novel telesurgical system for the 21st century. Surg Technol Int 2012;22:20-5. Gidaro S, Altobelli E, Falavolti C, Bove AM, Ruiz EM, Stark M, et al. 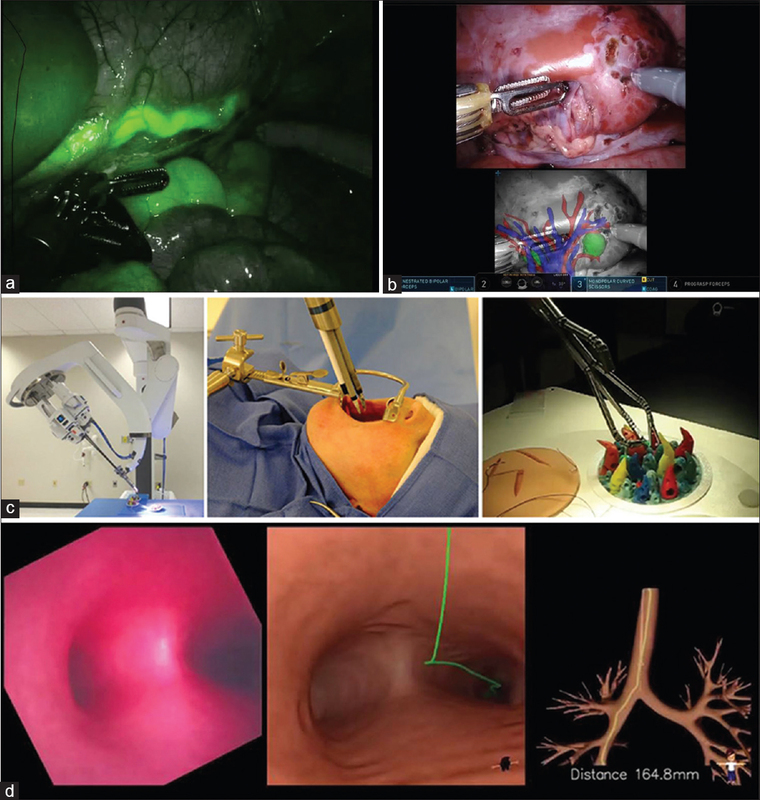 Vesicourethral anastomosis using a novel telesurgical system with haptic sensation, the telelap alf-X: A pilot study. Surg Technol Int 2014;24:35-40. Yi B, Wang G, Li J, Jiang J, Son Z, Su H, et al. The first clinical use of domestically produced Chinese minimally invasive surgical robot system “Micro Hand S”. Surg Endosc 2016;30:2649-55. Remacle M, Prasad V, Lawson G, Plisson L, Bachy V, Van der Vorst S, et al. Transoral robotic surgery (TORS) with the medrobotics flex™ system:First surgical application on humans. Eur Arch Otorhinolaryngol 2015;272:1451-5. Enayati N, De Momi E, Ferrigno G. Haptics in robot-assisted surgery: Challenges and benefits. IEEE Rev Biomed Eng 2016;9:49-65. Munawar A, Fischer G. A Surgical Robot Teleoperation Framework for Providing Haptic Feedback Incorporating Virtual Environment-Based Guidance. Frontiers in Robotics and AI; 2016. p. 3. Widmann G. Image-guided surgery and medical robotics in the cranial area. Biomed Imaging Interv J 2007;3:e11. Overley SC, Cho SK, Mehta AI, Arnold PM. Navigation and robotics in spinal surgery: Where are we now? Neurosurgery 2017;80:S86-99. Herrell SD, Galloway RL, Miga MI. Image guidance in robotic-assisted renal surgery. In: Liao JC, Su LM, editors. Advances in Image-Guided Urologic Surgery. New York: Springer New York; 2015. p. 221-41. Rassweiler JJ, Autorino R, Klein J, Mottrie A, Goezen AS, Stolzenburg JU, et al. Future of robotic surgery in urology. BJU Int 2017;120:822-41. Petscharnig S, Schöffmann K. Deep learning for shot classification in gynecologic surgery videos. In: Amsaleg L, Guðmundsson GÞ, Gurrin C, Jónsson BÞ, Satoh Si, editors. MultiMedia Modeling: 23rd International Conference, MMM 2017, Reykjavik, Iceland, January 4-6, 2017, Proceedings, Part I. Cham: Springer International Publishing; 2017. p. 702-13. Shademan A, Decker RS, Opfermann JD, Leonard S, Krieger A, Kim PC, et al. Supervised autonomous robotic soft tissue surgery. Sci Transl Med 2016;8:337ra64. Leonard S, Wu KL, Kim Y, Krieger A, Kim PC. Smart tissue anastomosis robot (STAR): A vision-guided robotics system for laparoscopic suturing. IEEE Trans Biomed Eng 2014;61:1305-17. Goh AC, Goldfarb DW, Sander JC, Miles BJ, Dunkin BJ. Global evaluative assessment of robotic skills: Validation of a clinical assessment tool to measure robotic surgical skills. J Urol 2012;187:247-52.